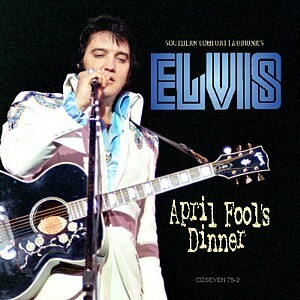 Originally issued as the classic vinyl bootleg 'Rockin' with Elvis April Fool's Day', this new Audionics -Southern Comfort release 'April Fool's Dinner' is somewhat of a nostalgic ride for hard-core Elvis collectors. 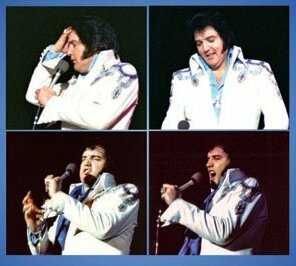 With upgraded audio, at last taken straight from the original Master Tape, the show itself is a classic of Elvis having fun with his fans as well as enjoying being back on stage. While the concert was recorded from the audience there are plenty of highlights, plus some fine bonus tracks from the Midnight Closing concert. Although having turned forty earlier in the year and having also been hospitalised Elvis’ March 1975 Vegas season, his 12th in Las Vegas, found him back in fine form. Despite the fact that ill health had caused his regular January season to be postponed for two months, Elvis’ mood had improved, perhaps due to the new presence of girlfriend Sheila Ryan. Elvis had recorded his final studio album ‘Today’ only 2 weeks before and although the album wouldn’t be released until May 1975 Elvis was happy to include songs from it in his set-list. Gone were his regular jumpsuits along with his 1974 Karate rambles to the audience. The FTD ‘Big Boss Man’ presented Elvis’ fine performance from March 30th Dinner Show (Barbra Streisand was in the audience) while the Audionics/Fort Baxter team released the Friday March 22nd Midnight concert on 'Back With A Bang'. Now Audionics have teamed with 'Southern Comfort' to release the April 1st Dinner Show. 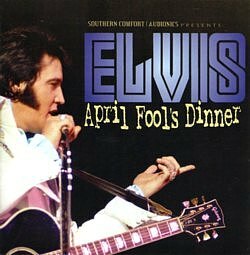 It is worth noting that this concert was one of the original classic vinyl Bootlegs when released as 'Rockin' with Elvis April Fool's Day'. 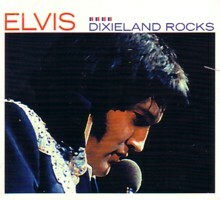 Back in those days recordings of Elvis' concerts were hard to find (how things have changed!) and no one cared that it came from an audience tape. When it was re-released in 1992 on CD it was still sourced from the original vinyl copy - along with all its pops & crackle! Here 'Audionics' presents with an upgraded version taken straight from the original Master Tape. The audio quality is greatly improved but fans must realise that it is still an audience recording and not a soundboard. WOW! What a sensational design! As a fold-out 3 sided digipack, with a slip-in 8 page booklet, this is a real stunner. Real glossy quality photographs. Featuring photographs from Sandi Pichon's collection & Geoff The Chef memorabilia plus sleeve notes by Edward Dooling the design is very impressive. The photographs are of beautiful quality with Elvis looking very fine in his two piece suits of the time. The credit is 'Black & White Designs'. "In January Led Zeppelin sells out the Garden in New York. President Ford will soon tell bankrupt New York City to "Drop Dead." John Lennon releases his '50s-flavored "Rock'n'Roll" LP. And Elvis spends his birthday brooding over turning a mere 40 - "old" before his time. He cancels his Vegas engagement, is hospitalized and soon joined by his stricken father. By March 18th, Elvis takes another shake at the "bright light city" exactly 20 years from playing the pre-national fame circuit of high school gymnasiums, jamborees, the Louisiana Hayride and dusty cowtown auditoriums such as in Odessa, Texas. Reports are that on stage Elvis has dropped most of the karate and is even curtailing some of the lightweight musical nostalgia. On this night, funky bassman Duke Bardwell plays for the last time in the King's court. Even bow-tied Washington Post scribes George F. Will cheers this Vegas stint. Elvis is "the senior lion of the pop music jungle... stirring those passions that cause people to lose their kinship with the devine... Elvis has his act together." The show itself is a classic with Elvis not rushing songs as he sometimes would, and really enjoying his singing. There are plenty of highlights and since the audience recording is obviously from very close to the stage at times there is a very intimate concert feel. Even better the running time of the CD is filled with some great bonus tracks from the Midnight Closing concert. Being an audience recording these CDs do benefit from being played through loud-speakers which help give you the space of an "in concert" feeling, rather than through headphones. Without the 2001 introduction it is straight into ‘C.C Rider' with the audience tape letting you get the atmousphere of being there in the showroom. Elvis punches out the first words and you can tell he is ready to lay on a fine performance. At the start of 'I Got A Woman' an audience member in the balcony keeps shouting "Look up here" even getting to the point of shouting, "Elvis Presley this is your goddamn doing!" But Elvis tackles the heckling with great aplomb, cutely throwing is a line of "Why me Lord"! He also sings a great line of, "Well, well, well… look up there." Even introducing himself Elvis adds, "My name is Wayne Newton... Were gonna' do a lot of songs, give out a lot of scarves and look up in the balcony a lot"
It's another classic Elvis concert moment. Elvis must have been in great humour that night as he then pretends to seriously announce, "Oh yeah. The second half of the show has been cancelled tonight." 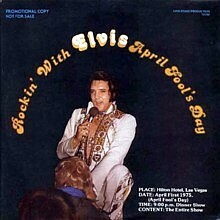 As the audience groans Elvis cleverly notes, "April Fool!!" 'Love Me' and 'If You Love Me' are regular versions for this 1975 season but a delicious version of 'And I Love You So' follows. 'And I Love You So' is a real highlight with the sound surprisingly good for an audience tape. The band and orchestra are well mixed and the sound is close to soundboard quality - but of course you also get the emotional impact of 'being in the audience'. An enthusiastic Elvis rocks out on 'Big Boss Man' but here (as in other places) the original tape suffers from overload at the loud audio peaks. It is interesting that the night before Elvis had stopped the band playing 'Big Boss Man' announcing that, "I don't like it, I'm tired of Big Boss Man" - but here he is back and enjoying it. 'The Wonder Of You' is odd since Elvis jumps straight into the second verse "And when you smile the world is brighter". This is the same as he did the previous night's concert but notes to the band during the guitar solos, "you're right!" ‘Burning Love' which follows had been dropped from Elvis’ set-list for over two years but was back this season. Rocking out, Elvis obviously enjoys himself and lays down a funky ending. As on other 1975 concerts Elvis then jokes with the crowd about having caught "the creeping crud" before the band introductions. By 1975 Elvis was extending his introductions and giving the band a few solo spots but luckily here they include a short but fine 'What'd I Say' and don’t continue on like they would in 1976. Note: In the 1970s Roy Clark was a key Country Music performer who co-hosted TV's 'Hee Haw' and even toured the Soviet Union. Fans knew him for a very humorous yodelling version of The Platters' 'The Great Pretender' - hence Elvis' reference. Elvis also introduces hotel owner Conrad Hilton touchingly adding, "Thank you so much for being so nice to me." 'My Boy' which follows is another highlight but also suffers from some a little distortion at points. 'I Remember You' is another delight with Elvis sounding like he is really enjoying singing the song this night adding a few extra hums along the way. On the FTD ‘Big Boss Man’ Elvis unfortunately became very distracted during this classic song which spoiled the beautiful emotion of it. Showing his positive mood similarly 'Let Me Be There' also has Elvis singing along right from the start and gets a big crowd response at the end. 'How Great Thou Art' was one of Elvis' key songs of this season and again it's an impressive performance with a power ending. 'Fairytale' was another new song introduced this season and shows Elvis in fine form and enjoying the new song and playing with the melody. Sadly the audio quality drops at points. "It's been a pleasure working for you, 'til we see you again" takes Elvis to 'Can't Help Falling in Love' and heading back to his suite. This song was edited on the first release but here is the restored from the original tape. Demonstrating how difficult it was to get these audience recordings you can hear the cassette recorder being hidden from security as the sound suddenly goes very muffled. The CD ends with 6 Bonus Tracks all highlights of April 1st Midnight, Closing Show. The two first tracks ‘Big Boss Man’ and ‘It's Midnight’ both come from a booth recording so are in stereo. This gives them a fuller sound and an even better Showroom atmousphere. ‘Big Boss Man’ makes up for any disappointment in the peak distortion of the Dinner Show version. Its sounds great and Elvis is in great form. ‘It's Midnight’ has three funny false starts, "Wait a minute!" all treated with good humour from Elvis as he teases the band. "Where is all my self-control? Wishing I could be the man, I try to..
..I’m gonna’ be over Vegas, when I’m through!.. But it's Midnight, ohh and I miss you"
The audio quality of the final 4 songs is a little more variable than the Dinner Show concert. ‘You Don't Have To Say You Love Me’ was a concert rarity in 1975 and was only performed twice in this Vegas season. The FTB ‘Big Boss Man’ features the soundboard of the only other performance from the night before. There’s an amazing shriek from the crowd at the start of this night’s performance with this version taken at a much faster tempo than Elvis had done in the past. Although obviously a crowd favourite Elvis would perform the song only a handful of times more in his career. Is sung with enthusiasm by Elvis but the audience recorded sound doesn’t really work for a song that has such big audio dynamics. However this is a worthy addition for being able to hear Elvis adding the very telling line about bassist Duke Bardwell during the "All My Trials" section. 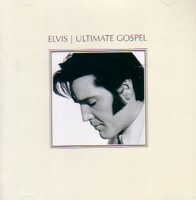 Elvis sings, "You know my bass-man’s bound to die, And all my trials will soon be over"! The tension between Elvis and Duke Bardwell had peaked and this Closing Show would indeed be the last time that Duke Bardwell would ever perform with the King. The ‘Mickey Mouse March’ is a fabulous addition and almost the whole song, not a simple one-liner! The audience love it and join in with The Sweets then taking over on the verses. Elvis laughs, "It’s good you know it!" What fun. Elvis also returned to this crazy song at his Lake Tahoe May 9, 1976, closing show. ‘Steamroller Blues’ was similarly another 1975 set-list rarity and only sung twice this Vegas season. It is the final track of the CD and although a short & sweet version it’s a funky final treat. Verdict: Maybe there is some nostalgia at work here but I found a real pleasure in re-discovering this up-dated old bootleg favourite. ‘April Fool’s Dinner’ offers plenty of Elvis delights and is a great document of the final shows of this Las Vegas season. The final extra songs from the Closing Night show are a great selection and this time a real Bonus. The stunning cover design makes this a very tempting treat for collectors. It is a must for old bootleg vinyl collectors and audience recording enthusiasts. To be honest, for the average fan to get a taste of this interesting Vegas season I would still recommend them to get the concert soundboards of the FTD ‘Big Boss Man’ and ‘Back With A Bang’ first (for the audio quality) - but ‘April Fool’s Dinner’ will still get plenty of spins from me. Left: April Fool's Dinner, Booklet cover. *EIN Note. Since I wrote this review FTD have announced that their next release DIXIELAND DELIGHT will be released as a 5" digipack and will included a 4 page colour booklet. So maybe they have been listening to fan complaints about the FTD lack of sleeve design and information with their regular releases. Note - EIN does not support bootleggers since they do deprive songwriters & musicians of their well-deserved earnings. There is however no doubt that FTD/BMG check on these similar 'Classic Concerts' upgrades and bookelt designs for future collector's releases as in the upcoming Dixeland Delight. Bonus Tracks from April 1st Midnight, Closing Show.